I love getting parcels and letters in the mail and it's even better when they're a surprise. So imagine my astonishment and delight at coming home to a parcel from The Bay containing a black sequined racerback tank top from Material Girl, the clothing line by Madonna and her daughter Lola. The Bay is slated to start carrying the Material Girl clothing line in spring 2011, but in the meantime they're selling these limited edition racerback tanks available in 9 different colours. The tank is fully lined and the sequins are sewn on quite well--they lie flat and don't come off easily or scratch my skin. All in all, it's surprisingly good quality for a tank priced at $19.99. The rest of the Material Girl line is priced at $12-68 and is intended to "offer fashion lovers savvy style with amazing value" according to Bonnie Brooks in the accompanying press release. I'm usually pretty indifferent towards celebrity clothing lines, but if what Brooks said is true and Material Girl features some interesting pieces at good price points, I'd be curious about what the rest of the line looks like in-person. Wearing sequins in the evening is a no-brainer, but how do you wear a revealing racerback sequined tank during the day in a way that's work-appropriate? That was the challenge I set myself to prove how versatile this piece was. The solution: Layer a cami underneath and a shirtdress on top. While we're on the topic of the outfit above, how about those gorgeous OMG rings by Wendy Brandes? She's donating partial proceeds from jewelry sales to help a blogger in need. You can read more about the campaign here. $200 from the sale of every F#@!/OMG ring set will be donated, so if you've ever admired these rings on my humble little blog and wished for a set of your own, now is the time to buy them! That tank is going to get gobs of use, I'm sure! Love how you've dressed it down here. WOW! Lucky girl! Loves it :) and LOVE U! Love seeing my jewels on you! Hope you're having a wonderful day hun. That tank is cute. I haven't seen any of the mg pieces in the macy's store near me. that is where they are supposed to sell it here where i'm from. the sequin tank is very cute. also love those OMG rings by wendy! PS what nail polish are you rocking? LPF, it's Mint Candy Apple by Essie. Any ideas on what you'll pair the racerback tank for a night time/party look? How can this piece go from day to night? And yes to the OMG rings! You're a true Wendy Brandes model! You look adorable! I love that sequin tank. I've seen it around the blogosphere and I love how you styled it xo. Good to know that the top doesn't scratch skin... I've had enough of annoying sequins that do that! I can't believe those are rings! I thought you had written the font in while showing your nail colour, silly me. Haha. Anyway, I checked her site Wendy Brandes designs some amazing jewelry! Great combo with the shirt! You have great style! Oh I love the sequin shirt! And look at you with those over-the-knee boots! So hot! I'm one of those ladies that has coveted your Wendy jewels- Love them ;) Going to check out the campaign now. Hope you are having a great holiday season, Lisa! gorgeous style. the tanktop is really rock n roll, fierce. 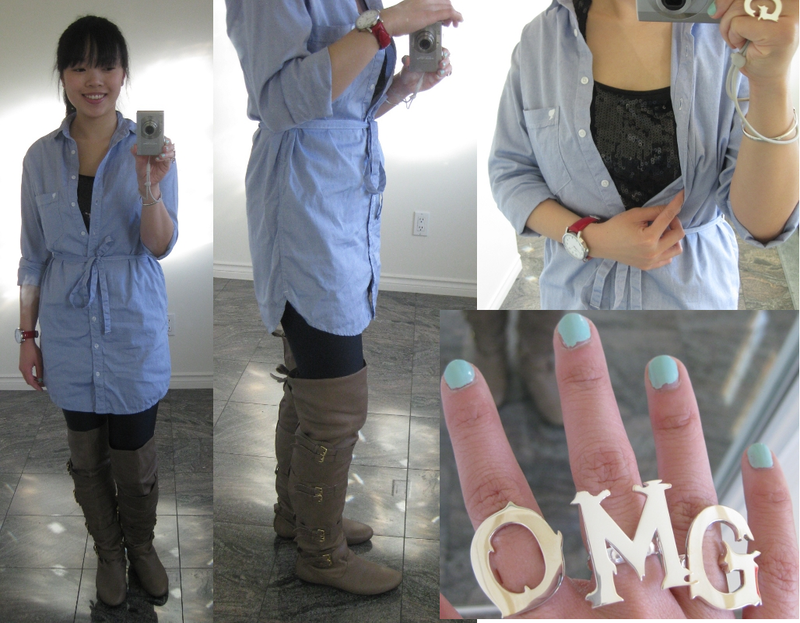 great day outfit, and love the ring shots and sister wolf shout out- she's amazing! nice work with the daytime sequins! I've seen some pieces but nothing that i had to have... awesome rings! I dig that sequin tank and I love how you paired it with that shirtdress - Lovely! And your piqued my interest in that Material Girl line. I got the Material Girl tank too. It's pretty cute, I must admit. Oh I didnt know The Bay carried the Material Girl clothing line!! good to know, thanks! I like your day-to-night use! The racerback detail intrigues me on this dress. It's just a bit quirky and makes the piece so much more interesting!